All-in-one pyjamas with either zip or pop stud fastening to the front or back and pop stud fastening around the groin allowing them to open completely like a large babygro. They are loose fitting for comfort and have a slightly longer body compared with our standard all-in-ones. Each fleece all-in-one is made by us in the UK and is made to last. You can choose to add a hood, foldover or enclosed mittens, feet, gripper soles and pockets to your all-in-one. Fabric: 100% polyester fleece. Machine washable. Colours: Hold your mouse over a colour to the right to see a larger image. All-in-ones are available in Petite and Tall fit as well. Order before 1pm for next day dispatch of your made to order items. Can't see the size you need? Contact us letting us know your measurements and we'll send you a quote. 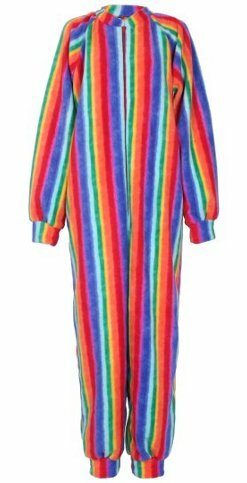 Onesie with attached feet and fabric soles. 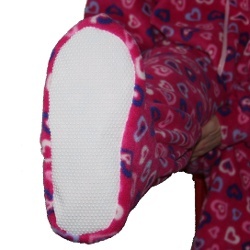 Onesie with Gripper Soles to help prevent slipping. Bear and Bunny ears - choose a contrasting colour for the inside of your ears. Foldover Mittens - have an opening and can be folded back so you can use your hands. Enclosed mittens - are sewn all around and have no opening. Side Pockets - placed on the sideseam just like jacket pockets. Pouch Pockets - on the front either side of the zip. Top Pockets - ideally placed for your music player. Which side is which? - Choose your pockets as if you are wearing the all-in-one as shown in the image.